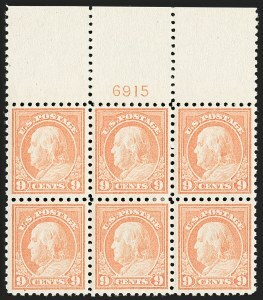 The 15¢ 1916 Unwatermarked Perf 10 is exceedingly difficult to find as a plate block in Mint N.H. condition. A review of our records reveals that we have never sold one from any position since 1993. We are aware of only two full top plate blocks in Mint N.H. condition--formerly in the Fogelson and Wampler collections. 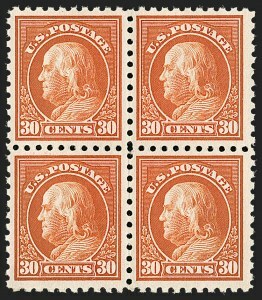 Official Bureau records do not specifically identify a printing of the 30¢ value on unwatermarked paper that was perforated gauge 10. 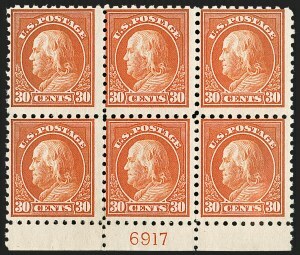 However, in the past 100 years two panes of 100 each (200 stamps in all) have surfaced--both of which have been certified by The Philatelic Foundation--clearly attesting to the existence of such a variety. The first pane discovered was a lower right pane from Plate 6917, which was first certified by the P.F. in 1947. This pane had plate blocks at the bottom (offered here) and at right. The second pane discovered was an upper right pane from Plate 6911 with plate blocks at the top (ex Fogelson) and at right (ex Hall). These four plate blocks come from these two panes, and the bottom and top positions are each unique. A bottom Plate 6914 single has been certified, obviously from a different pane. 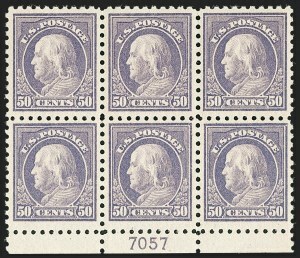 Two complete panes of 100 of Scott 476A have been certified by The Philatelic Foundation and subsequently broken up into singles, blocks and four plate blocks. 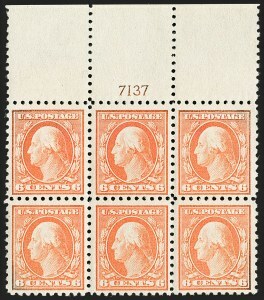 Many of the stamps from the lower right pane of 100 from Plate 6917 are centered to the left. 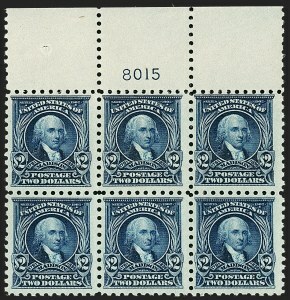 This block is exceptional for that pane, as all four stamps are well-centered with wide margins. 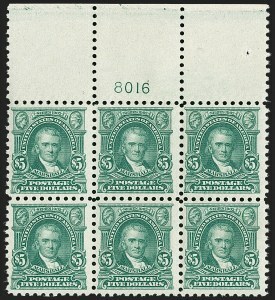 Position 32, the upper left stamp in this block, is very choice. Interestingly, one of the finest centered stamps from the Plate 6911 pane of 100 is also from Position 32 (graded VF-XF 85 by The Philatelic Foundation). 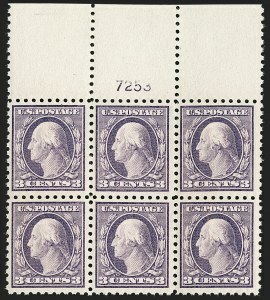 Lewis Kaufman records only seven plate number blocks of Scott 477, including top 7040, top 7049 (ex Fogelson), top 7057 (in the Miller collection, The New York Public Library), bottom 7057 (offered here, 1993 Rarities sale), bottom 7057 (ex Todd and Wampler), right 7040 (ex Curtis) and right 7057. 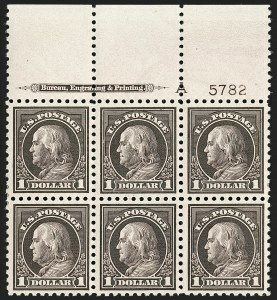 Plate 5782 was the only plate used to print the $1.00 Franklin (Scott 423, 460, 478 and 518). 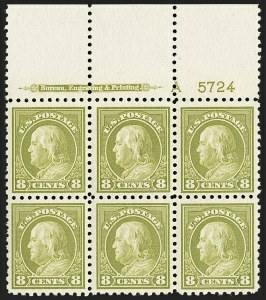 Lewis Kaufman records 13 available top plate number blocks of Scott 478 (plus four bottom plate blocks), but not all of these are full tops as several have reduced selvage (there is a top position in the Miller collection owned by The New York Public Library). 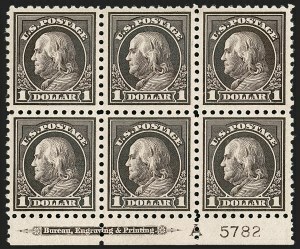 Plate 5782 was the only plate used to print the $1.00 Franklin (Scott 423, 460, 478 and 518). 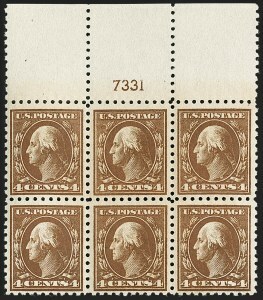 Lewis Kaufman records 13 available top plate number blocks and four bottom plate blocks of Scott 478 (there is a top position in the Miller collection owned by The New York Public Library). 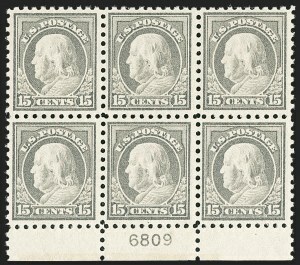 This bottom plate block has particularly choice centering and is one of the finest of the small number known.